Wigan Warriors U19s will play their Academy Under-19s Grand Final against Leeds Rhinos at the DW Stadium. The match takes place this Friday with a 5.30pm kick-off, with the game also acting as a curtain-raiser to the first team's clash with Hull FC in the final Super 8s game of the season at 7.45pm. 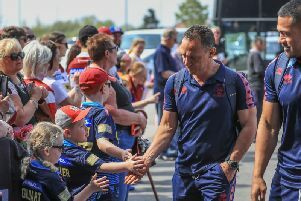 Wigan Warriors Executive Director, Kris Radlinski said: “Those who have followed our U19s side this season have seen an extremely talented and well-drilled side who deserve a large audience on the big stage. It is Wigan's ninth Grand Final in 11 seasons at this level, and in previous years they have had to forfeit home advantage when the DW Stadium has not been available.